This sample price: priced within the past 7 days for arrival on Thursday, October 31, 2019, departure from New York City (all Airports), NY. Choose your own departure city and dates. 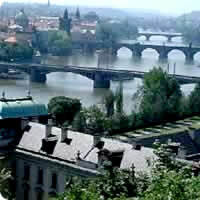 A popular combination in eastern Europe, this tour will lead you through four charming cities. Begin in Budapest (a cultural masterpiece; museums, theaters, monuments), then continue to Prague (the city of 1,000 Spires, a reference to the sheer number of churches raised by various controlling hands of the city in its centuries long history), Krakow (a cultural and artistic center of Poland; the Medieval Old Town is incredible) and finally Warsaw (with a wealth of shops and restaurants, public parks and outdoor cafes). Travel between each city on the train. This is a flexible vacation package. Select your number of nights in each city, desired hotel and activities.